Spoiler Alert: If you’ve not yet seen the live-action version of Beauty and the Beast, be warned that reading this article might influence the way you view the film. The Emma Watson-helmed flick contains all sorts of Easter Eggs and homages to other Disney, Harry Potter, and Broadway classics (see if you can spot ’em!). But there’s one clue that suggests a whole blending of worlds, when Belle takes the Beast to her parents’ home outside Paris. There we see Notre Dame gracing the Paris skyline, but no Eiffel Tower. Beauty and the Beast is set in the mid-1700s, but the Eiffel Tower wasn’t built until 1887. Well, you’ve heard of The Hunchback of Notre Dame, right? That adored Disney character who lives in the bell tower? Yep, that’s right: Quasimodo. So, it’s safe to guess that Disney wants you to imagine it’s Quasimodo hanging out in the gorgeous structure. Granted, we’ve seen crossover between the two movies before. After all, Disney released Hunchback five years after Beauty and the Beast. 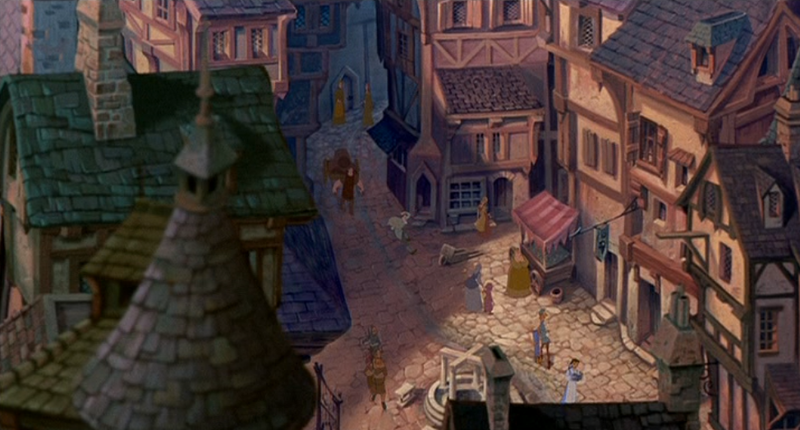 In fact, in one of the early scenes of Hunchback, Belle wanders through the streets of Paris. They totally lived in the same universe! Let’s clarify: This doesn’t mean they lived in the same historic time period. No, Disney and its writers and Imagineers don’t have to stick with such mundanity as accuracy. They wave their magic wands and dream up whole new worlds. The Hunchback of Notre Dame, based on the novel by Victor Hugo, is set in 1482, which is about 300 years before Beauty and the Beast. But, if anyone has the power to blend that era into the late 1700s, making one epic Parisian expanded universe that includes two of our most beloved characters, it’s Disney.